Man on a Mission at the New Jersey Alpaca Classic. Syracuse, NY – Organizers of the 2014 nationally-certified Empire Alpaca Extravaganza are making a concerted effort to attract visitors interested in learning about how raising the finely-fibered animals provides income and lifestyle opportunities. Farms from Wayne County and the Finger Lakes region will be among the competitors from across the Northeast and Mid-Atlantic regions at the New York State Fairgrounds in Syracuse on October 25-26. The show will offer educational seminars, a fashion show, youth activities and more. Show admission and parking are free. To facilitate potential buyers and those interested in starting an alpaca enterprise, the Empire Alpaca Association will offer educational seminars on marketing, merchandising, fiber processing, and income opportunities with respected owners, breeders, and fiber artisans. Alpaca breeders and owners will show their animals and fleeces and will have booths with value-added products and information about their farms and animals for sale or breeding rights. A parade of animals available for sale by private treaty will begin at 12:45pm on Saturday. Interested buyers can place silent bids until noon on Sunday. The two-day, 9am-4pm Empire Alpaca Extravaganza on Saturday, October 25 and Sunday, October 26, also includes fiber arts demonstrations, a fleece competition, and a new ‘Vendor Way’ with everything from alpaca-specific farm supplies to yarn, batts, sheared fleeces, socks, sweaters, and handcrafted goods. Youth activities at the show will include hands-on fiber crafts and demonstrations. The Sunday afternoon show schedule includes performance, obstacle and youth costume classes. Alpacas, native to the South American Andes Mountain region, are raised for their luxurious and durable fiber that is highly prized by the garment industry, crafters and artisans, and people who prefer natural fibers but are allergic to wool. The teddy bear-like Huacaya alpacas account for 99 percent of the alpaca population; Suri alpacas have silken fiber dreadlocks that grow up to 15 inches long. American alpaca enterprises developed with the first animal imports into the U.S. in 1982. A business model that does not allow artificial insemination helps maintain animal breeding and sales values which can be worth several thousand dollars. Sixteen NY farms formed the Empire Alpaca Association/EAA in 2002 following the first Empire Alpaca Extravaganza show event. The association now has members ranging from small farms to some of the largest in the U.S. The EAA is the first affiliate of the Alpaca Owners and Breeders Association to create a Code of Ethics. Find more information online at www.empirealpacaassociation.com/Show/. 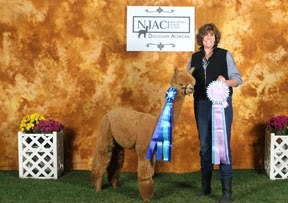 0 Comments to "Public Invited to Discover Alpacas at October 25-26 Empire Alpaca Extravaganza "